The Mars Global Surveyor Orbiter Camera (MOC) acquired this high resolution image of a flow ejecta crater on November 19, 1997, at 8:26 PM PST, about 18 minutes after the start the 45th orbit of Mars. The area shown is roughly 6.5 by 40.2 kilometers (4 by 25 miles), and is located near 40 degrees South latitude, 120 degrees West longitude. 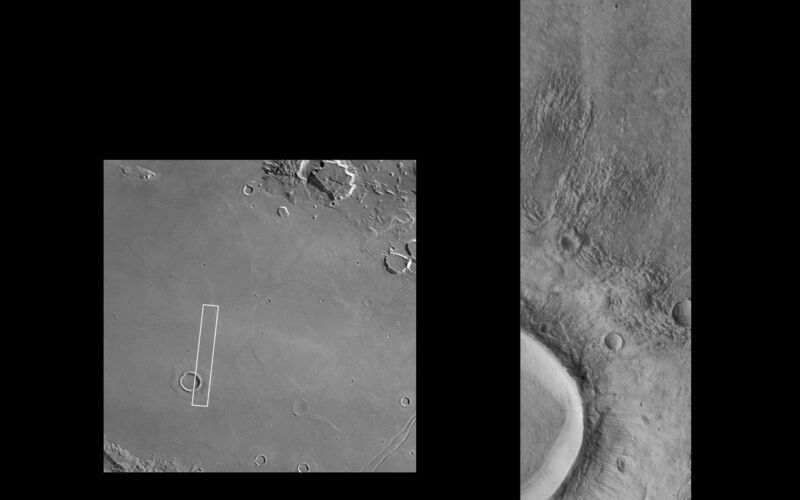 Features as small as 15-18 m (50-60 feet) across are visible in the picture. Flow ejecta craters are so named because the material blasted out of the crater during the impact process appears to have flowed across the surface of Mars. First seen in Mariner 9 images in 1973, and described in detail using Viking Orbiter images acquired in 1976-78, flow-ejecta craters are considered by many scientists to be evidence that liquid water could be found in the near-subsurface at the time the craters formed. 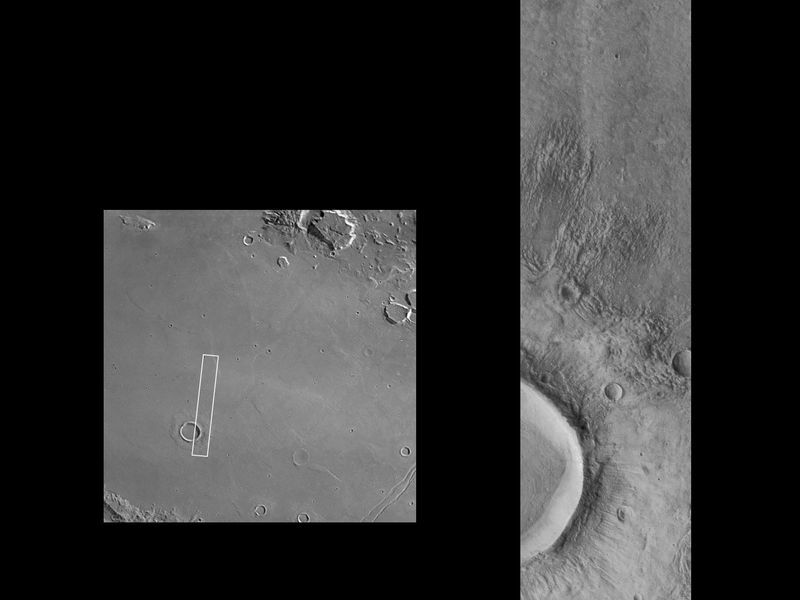 This image (right), a factor of two better than any previous view of such features (and a factor of 33 better than the best Viking frame of the specific crater, 056A61, left), shows two smaller, pre-existing craters and the interaction of the flowing ejecta with these craters. 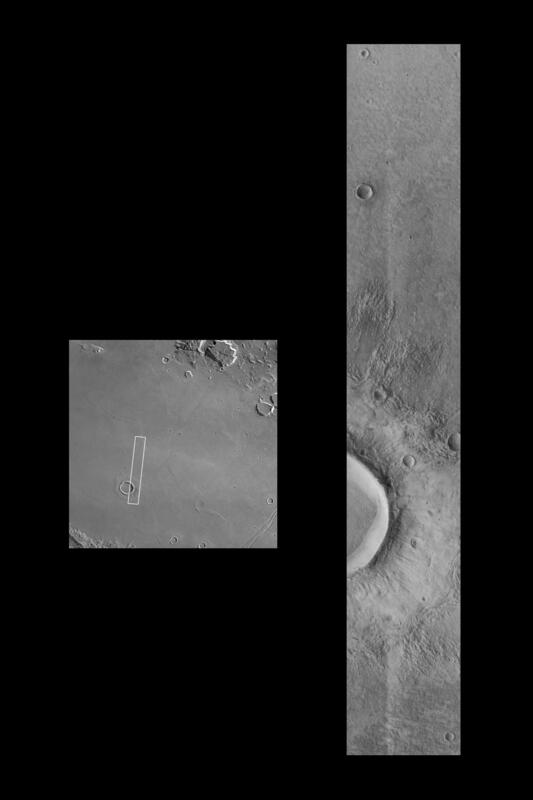 The uppermost small crater has been over-topped and partly buried by the flow, while the flow has been diverted around the lower crater. Ridges formed where the flow "stacked up" behind obstacles, or came to rest.